The 889 IC Sample Center is faster than all the other Metrohm sample changers. With less than 10 seconds from the start of the determination to the injection, it may well be a record-breaker. This means you reduce the time for the sample injection between analyses to a minimum. A higher sample throughput is guaranteed. The 889 IC Sample Center is also distinguished by its versatility. A very wide variety of injection methods can be selected: Full-Loop, Partial-Loop and Pick-up mode. The injection with Pressure-Assisted Sample Aspiration (PASA™) can be used with all three injection modes; this simplifies sample injection, particularly with viscous samples, by means of a headspace pressure. The flexibility is also evident in the variability of the sample volume. The standard accessories contain two 48-position sample racks for 300 µL and 700 µL sample vessels that can be used for injection volumes of 1 to 100 µL (in 1 µL increments). Nonetheless, other sample racks or micro titer plates in compliance with the SBS standard that are conventionally used in liquid chromatography can also be used together with the 889 IC Sample Center. Sample racks with 12 to 384 sample positions are supported. Sample vessels like those used in the HPLC can also be utilized here directly. The sample volume can range all the way from one microliter to ten milliliters. The choice is up to you. Similar capabilities with the addition of a sample cooling feature. The samples can be cooled in the range of 4oC to 22oC, a requirement for biologically active samples. 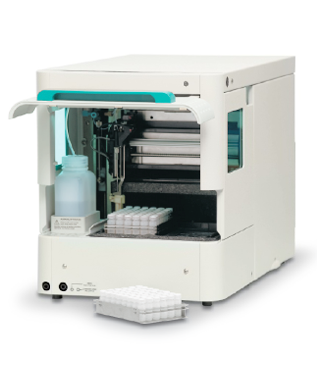 The 889 IC Sample Center – cool is the appropriate automation solution when you have only a very small amount of sample. In comparison with the 889 IC Sample Center, it possesses in addition a cooling function and is thus the ideal sample changer for biochemically relevant or thermally unstable samples. The 889 IC Sample Center – is a robust Autosampler for high sample throughput, optimized for the challenges of the modern analytic laboratory. It works in accordance with the x-y-z principle and a syringe control with high resolution for precise sample injection. A double needle system enables the penetration of vessel caps and septa. A PEEK injection valve completes the automation system of the 889 IC Sample Center – cool. The 889 IC Sample Center – cool is faster than all the other Metrohm sample changers. With less than 10 seconds from the start of the determination to the injection, it may well be a record-breaker. This means you reduce the time for the sample injection between analyses to a minimum. A higher sample throughput is guaranteed. The 889 IC Sample Center – cool is also distinguished by its versatility. A very wide variety of injection methods can be selected: Full-Loop, Partial-Loop and Pick-up mode. The injection with Pressure-Assisted Sample Aspiration (PASA™) can be used with all three injection modes; this simplifies sample injection, particularly with viscous samples, by means of a headspace pressure. The flexibility is also evident in the variability of the sample volume. The standard accessories contain two 48-position sample racks for 300 µL and 700 µL sample vessels that can be used for injection volumes of 1 to 100 µL (in 1 µL increments). Nonetheless, other sample racks or micro titer plates in compliance with the SBS standard that are conventionally used in liquid chromatography can also be used together with the 889 IC Sample Center. Sample racks with 12 to 384 sample positions are supported. Sample vessels like those used in the HPLC can also be utilized here directly. Your sample volume can range all the way from one microliter to ten milliliters. The choice is up to you. 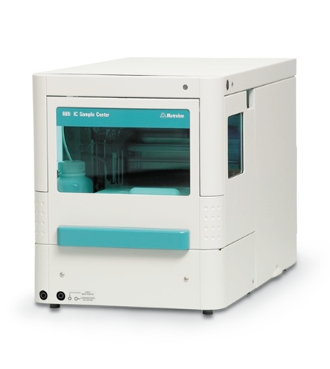 The 889 IC Sample Center – cool is equipped with a cooling function. In this version, a Peltier element ensures a stable temperature between 4 and 22°C for the cooling of your samples. This ingenious cooling system guarantees the same temperature throughout the entire cooling area. No temperature gradient can form. The condensation of cooling water is also prevented. An interesting option, and not only for the biochemical and clinical area. Because this is the way that samples which are critical with respect to stability, can also withstand long sample series without damage. The precision of your analysis results is increased.